It may not be as glitzy as its southern counterpart, but the Sunshine Coast is a great family holiday destination. There’s heaps to keep the family entertained – starting with miles of beautiful beaches, all of which have a character of their own, that are yours to explore. So, rain or shine, what can you do and see on your Sunshine Coast holiday? The beauty of the Sunshine Coast is that there are a variety of beaches in a relatively short distance and whether you have toddlers who paddle in the water’s edge or need waves for a surfing teenager, you will find a beach to suit. If you are looking at staying a while, why not even spread your visit over a couple of different locations. One of the best resources I like to use is the Surf Lifesaving Australia website, Beach Safe. Just type in the beach name for a range of useful photos and information. There are so many beaches on the Sunshine Coast that you will be sure to find one to suit your family perfectly. Patrolled beaches on the Sunshine Coast include: Kings Beach, Golden Beach, Bulcock Beach, Dicky Beach, Kawana, Mooloolaba, Alexandra Headland, Maroochydore, Marcoola, Coolum, Peregian Beach, Sunshine Beach, Noosa Heads and Rainbow Beach. 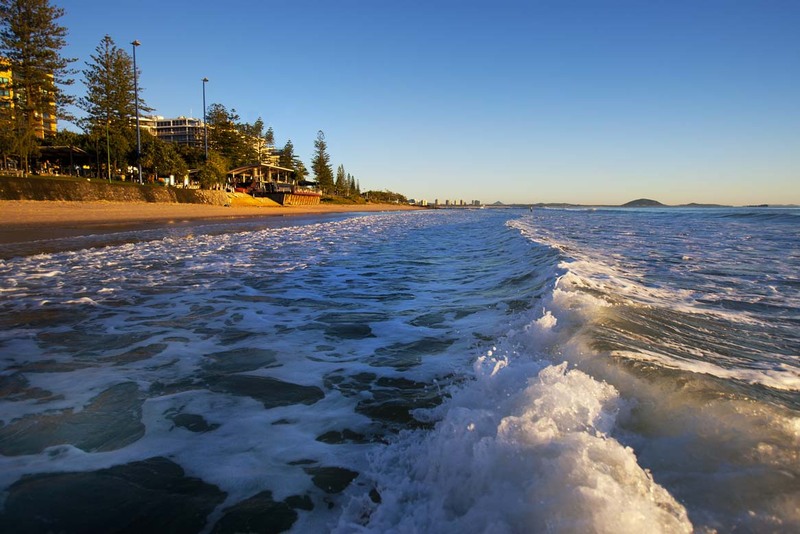 Sunshine Coast Tourism recommends Kings Beach, Bulcock Beach, Golden Beach, Cotton Tree, Mooloolaba Beach, Mooloolaba Spit and Noosa Main Beach as some of the best for children. A number of surf schools also offer lessons for beginner surfers, including children. 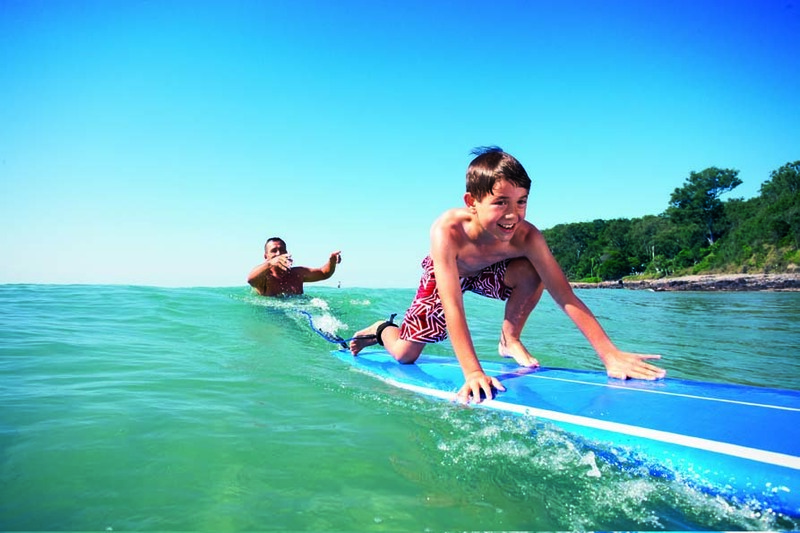 Surf lessons are one of the activities your children can enjoy on the Sunshine Coast. As a Victorian, I love having a meal at a Queensland surf club. Where else can you get a decent meal for a decent price, often with the most amazing views – and in a location where you can easily walk-off some over-indulgence right outside the door. Enjoy a meal at Sunshine Beach, Dicky Beach (Caloundra), Coolum, Mooloolaba, Marcoola, Maroochydore, Alexandra Headland, Noosa, Kawana and Caloundra. These places are always full of families, so you will feel at home. Still known as the Home of the Crocodile Hunter, Australia Zoo continues to thrive after the tragic death of Steve Irwin in 2006. A visit to the zoo will fill your day. You can self-drive or if you don’t have your own car, the Australia Zoo website details a number of ways to get to the site, including tour bus & public transport. 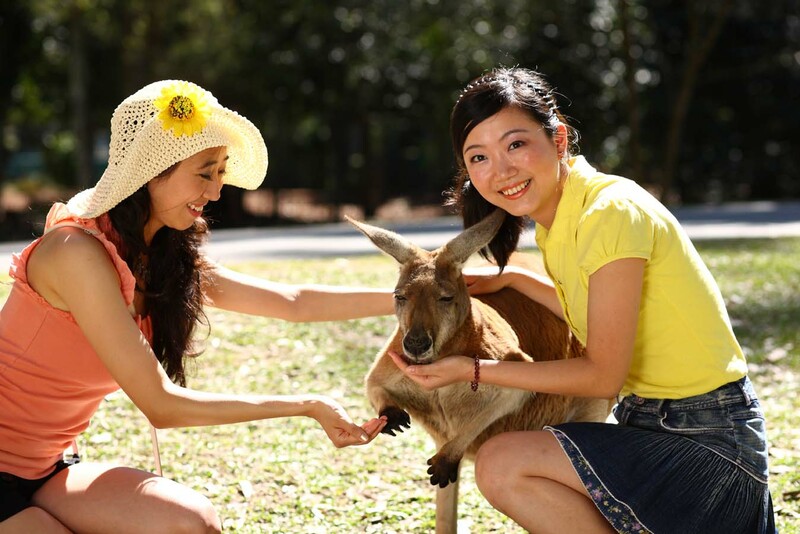 Get up close and personal with the animals at Australia Zoo. As well as the many animals to see, there are daily shows, including the Australia Zoo Wildlife Warriors adventure in the Crocoseum. There are too many animal experiences to detail here, but if you plan to do something extra, such as an animal encounters or the Zoo Keeper for a Day experience, it would be worthwhile pre-booking (Note: both of these involve extra cost). All the information can be found on the Australia Zoo website, on which you can plan and print out your own itinerary. Also check out special school holiday activities. The Noosa Headland walk is one of the most well-known, with the coastal track to Dolphin Point wheelchair & stroller accessible. However, there are many other walking trails throughout the region. For those wanting to get to know one of the many waterways, there are many options. A cruise is a great way to appreciate the Pumicestone Passage. The Noosa Ferry Cruise Company operates a daily ferry cruise service between the historic riverside town of Tewantin into the heart of Noosa Heads. A number of organised cruise tours and boat hire companies also operate on the coast, allowing you to discover the majestic waterways of the Noosa River, Maroochy River and Mooloolaba River & canals and the Pumicestone Passage at Caloundra. Hervey Bay further up the coast is one of Australia’s most renowned whale watching hotspots, but you can still see these majestic creatures from the Sunshine Coast. Whale One tours operate from Mooloolaba, while some of the Harvey Bay-based operators will pick you up from the Sunshine Coast for a day trip. If you want to self-drive to Hervey Bay, it is about a 2 hour drive from Noosa. As there are definitely more options from Hervey Bay – and this is where the whales are heading for mating and calving, why not organise to spend a night or 2 here as an extension of your Sunshine Coast holiday? With a climate that encourages outdoor lifestyle, there are plenty of playgrounds for your kids to burn up some holiday energy. 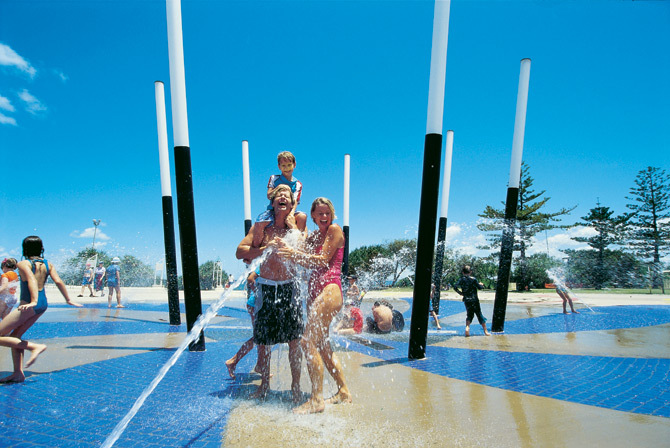 Playgrounds on the Sunshine Coast can be traditional ones – or fun water play parks. Great for cooling off. Use the Sunshine Coast’s Facilities and Recreation Directory to search for playgrounds, bike paths and more. You can also find some information on some of the best parks on local website, Sunny Coast Kids. The Sunshine Coast is not just about the beach – it is also about a spectacular rainforest hinterland. 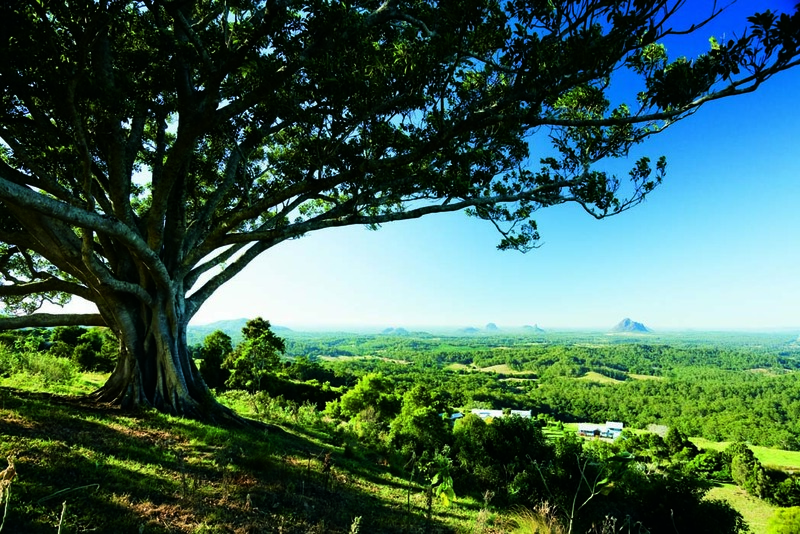 One of the great places to experience it is the Mary Cairncross Scenic Reserve, a 55 hectare piece of subtropical rainforest, overlooking the Glass House Mountains. Discover beautiful sub-tropical rainforest and Mary Cairncross Reserve. With more than 2km of walking tracks, boardwalks and viewing platforms, it will enable your family to enjoy the surrounds in a relaxing environment. There is also a café, picnic area, gass bbqs, children’s playground. The reserve is located in the beautiful hinterland township of Maleny, a historical town well-known for its arts and crafts and also, where you will also find Maleny Dairies. Maleny Dairies is a family owned dairy producing a range of milk products, including yoghurt. Farm tours are available Monday – Saturday and there is a kiosk where you can buy some yummy milky drinks. The tour will give your kids a great overview of how milk gets from the cow to the bottle or carton in the fridge. Experiencing local foods is one of the great things about holidaying – and the Sunshine Coast won’t let you down. One of the best meals I had when I visited last year was eating prawns fresh off the trawler at Mooloolaba. They had been cooked – I just took them back to my apartment, peeled and ate. Yum. 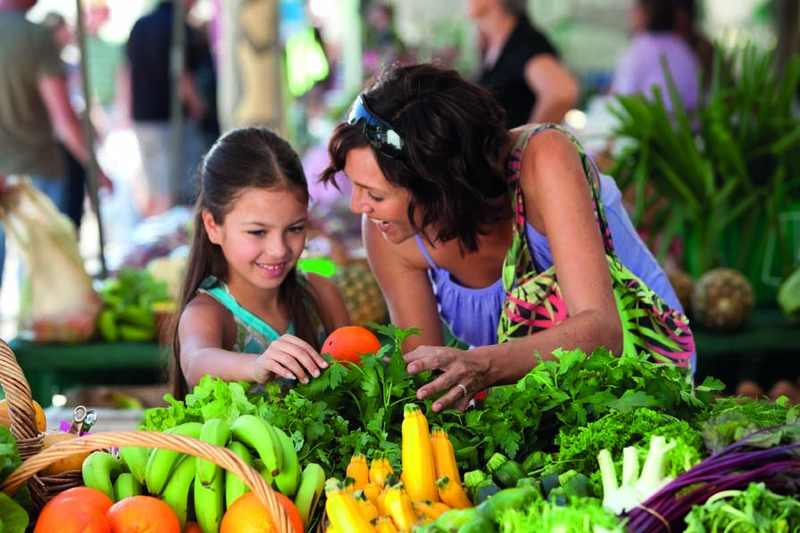 Visit local markets to eat and drink the very best of what the Sunshine Coast has to offer. The Big Pineapple now holds a market Saturday morning The market is best known for its huge variety of fresh and local produce. Virtually 50% of the area is dedicated to the sale of fresh produce, including fresh fruits and vegetables, meat, chicken, seafood and delicatessen products. Also check out this great website which includes heaps of information about experiencing local produce in the Sunshine Coast region, including cooking schools and markets. Also, don’t forget to ask the owner or manager where you are staying – more often than not, they can provide great tips on where to eat to help make the most of your holiday experience. On the face of it, your kids mightn’t get excited when you tell them you are going to a ginger factory, but this attraction is a family favourite and is a particularly great rainy day option. the Ginger story (see how ginger is grown, harvested and made into products). Visit the Ginger Factory website for more details. So, you can gaze out at sea, but to really understand what is going on underneath you need to check out Underwater World Sea Life on Mooloolaba Wharf. Completely undercover, this is another perfect option for a rainy day (but also should be on your itinerary even if the weather remains good). Underwater World has 16 themed zones to visit, including the Jellyfish Kingdom, Seahorse Sanctuary, Tidal Touch Pools, Seal Island, Shark Shipwreck, Turtle Temple and more. There are feed and talks scheduled throughout the day. And if your children are up to it, they can join the Ocean Ranger program during school holidays (booking required as places are limited). Adventurous families can also sleep under the sea and see what the creatures get up to at night. For more details, check out the website (and save if you book on-line). Where to go when it rains, but to a castle – Sunshine Castle to be precise – another wet day option for little knights and princesses. Sunshine Castle was actually built in the 1970s and is a Norman style Castle, with medieval additions, complete with moat, turrets, towers and drawbridge. Today it is filled with medieval displays and other exhibitions you can discover on a self-walk tour. Children can take part in a treasure hunt, and can choose a treat from the King’s treasure when their quest is complete. Included on site is a Lord of the Rings display and a toy and doll museum. Special school holiday activities are also on offer. A local re-enactment group has a sword fighting training and display on the front lawn of the Castle on the first and third Saturdays of the month, from 10am-midday. Sunshine Castle is located at Bli Bli. Aussie World is located inland from Caloundra, on the Bruce Highway. 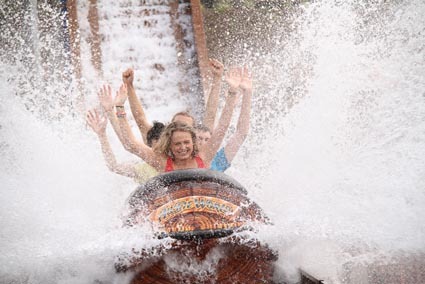 While not on the same level as the Gold Coast theme parks, there are enough rides to cater for all ages, with the admission price giving you unlimited rides (family tickets available. Discounts available for on-line purchase). Experience family fun at Aussie World – also home to the Ettamogah Pub. Aussie World is also home to the quirky Ettamogah Pub, where you can enjoy a pub meal. Who doesn’t like a family game of mini-golf? Top Shots Fun Park has two mini-golf courses for your family to navigate. Other attractions include blaster boats, vertical trampolining and an inflatable slide and cannonball blaster (both of which only operate on weekends and school holidays). Top Shots Fun Park is located in Maroochydore. For a look at some of these attractions, check out Sunshine Coast Tourism’s Attraction trail video. Need to know where to stay? Check out some great family friendly properties along the Coast. * Images provided by Sunshine Coast Destination Limited.